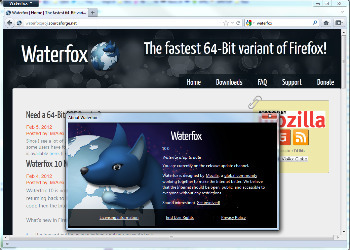 Waterfox is a 64-bit version of Firefox. Waterfox is modified version of the Firefox source code specifically for machines running 64-bit versions of Windows. Software designed for 64-bit Windows editions can take advantage of faster RAM and processing speeds and greater stability in 64-bit systems. Just converting Mozilla’s source code for 64-bit Windows isn’t enough, Waterfox takes it to another level with unique tweaks which help it exploit the speed of 64-bit systems. Waterfox is made with one thing in mind: speed. Waterfox offers 100% Firefox Add-on Compatibility and 64-bit Plugin Support. Fixed crashing that occured when a user didn’t have an exisiting Waterfox or Firefox profile.